In his post, “Sympathy for the Devil,” Dr. Brian Mattson connects the dots and demonstrates The Noah movie is not a Bible movie, but it’s “creative license” was issued from the Kabbalah, and other Gnostic sources, from the bodiless Adam and Eve at the beginning of the film, to the circular rainbow at the end of the film. Dr. Mattson recommends that all Christians get informed on Gnosticism so they can spot this kind of stuff in the future. He recommends we begin by reading Against Heresies by the Church Father Irenaeus of Lyons (begin here). It gave us most of what we’ve known about Gnosticism since the late second century. It’s required reading in this era of Gnostic revival. 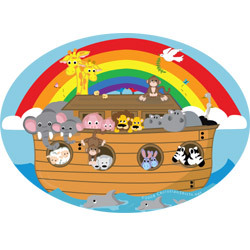 Noah is only the latest platform promoting Gnosticism in our culture. For the record, no one is saying don’t go see the movie. What people like me would say is be an informed viewer. I don’t care if you like it or hate it, or if you ever see it. But if you do, do not miss the fact that there is more to “creative license” than meets the eye. We could all be accused of gnosticism if we really look at our theologies and are honest. I see this accusation slung around so much, and it appears we don’t really understand what gnosticism is. Real historical gnosticism that is. Or what the “defenders of orthodoxy” back in the Ante Nicene Church used as arguments against it. if we did, and realized that many of those same arguments could be used against Evangelicals (and in some cases Catholics) we would be far less hesitant in using gnosticism as an argument against others we don’t like or disagree with. I agree we can sometimes be quick to label things Gnostic that were not intended to be so. The critic may simply be incorrect in his analysis, or the Gnosticism of the subject being critiqued may simply be unaware of the Gnostic tendencies in his own thinking. The great heresies of ancient church history recur in every generation, and I think it is due basically to “repeating the mistakes” of the ancient heretics. We are finite human beings, who make a finite number of mistakes in our thinking, among other things, and when our minds are not sufficiently informed by sound theology and renewed by the Word of God, we can and do repeat errors which were historically dealt with in history. Therefore I also agree with your assertion that some Evangelicals do repeat the mistakes of Gnosticism among other heresies. No one is free from the danger of repeating the mistakes of the heretics when they aren’t sufficiently informed by the Word as it is received by those who subscribe to Nicene orthodoxy.